Bu SVG dosyasının PNG önizlemesinin boyutu: 800 × 533 piksel. Diğer çözünürlükleri: 320 × 213 piksel | 640 × 427 piksel | 1.024 × 683 piksel | 1.280 × 853 piksel | 900 × 600 piksel. 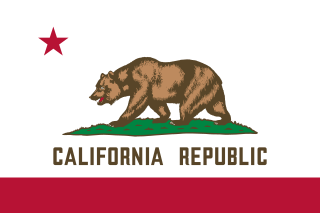 English: Flag of California. This version is designed to accurately depict the standard print of the bear as well as adhere to the official flag code regarding the size, position and proportion of the bear, the colors of the flag, and the position and size of the star. Русский: Флаг Калифорнии. Соответствует официальному описанию пропорций размеров, положению звезды и медведя, а также оттенков цвета. Bu SVG dosyasındaki kaynak kod W3C standartlarına uygundur. Bu görüntüde bir bayrak, arma, mühür veya başka bir resmi nişan gösterilmektedir. Bu sembollerin kullanımı bir çok ülkede kısıtlanmıştır. Bu kısıtlamalar telif hakkı durumundan bağımsızdır. This work was created by a government unit (including state, county, city, and municipal government agencies) that derives its powers from the laws of the State of California and is subject to disclosure under the California Public Records Act (Government Code § 6250 et seq.). It is a public record that was not created by an agency which state law has allowed to claim copyright and is therefore in the public domain in the United States. Pursuant to the California Public Records Act (Government Code § 6250 et seq.) "Public records" include "any writing containing information relating to the conduct of the public’s business prepared, owned, used, or retained by any state or local agency regardless of physical form or characteristics." (Cal. Gov't. Code § 6252(e).) notes that "[a]ll public records are subject to disclosure unless the Public Records Act expressly provides otherwise." County of Santa Clara v. CFAC California Government Code § 6254 lists categories of documents not subject to disclosure under the Public Records Act. In addition, computer software is not considered a public record, while data and statistics collected (whether collected knowingly or unknowingly) by a government authority whose powers derive from the laws of California are public records (such as license plate reader images) pursuant to EFF & ACLU of Southern California v. Los Angeles Police Department & Los Angeles County Sheriff's Department and are not exempt from disclosure and are public records. Although the act only covers “writing,” the Act, pursuant to Government Code § 6252(g), states: “Writing” means any handwriting, typewriting, printing, photostating, photographing, photocopying, transmitting by electronic mail or facsimile, and every other means of recording upon any tangible thing any form of communication or representation, including letters, words, pictures, sounds, or symbols, or combinations thereof, and any record thereby created, regardless of the manner in which the record has been stored. Pursuant to Senate Bill 1421 (Chapter 988 of the California Statutes), since January 1, 2019, any disciplinary, investigative, or any other investigation into any peace officer within the state that has records pertaining to the aforementioned reasons held by any agency in the state, are public records. This bill is retroactive, so records pertaining to the aforementioned that are from the past are now public records. However, the Bill only requires agencies to preserve such records for five years before such records may be destroyed. County boards of education. See Education Code § 1044. School districts. See Education Code § 35170. Community college districts. See Education Code § 72207. The Department of Toxic Substances Control. See Health & Safety Code §§ 25111, 25201.11. The Health and Human Services Agency (as to certain specified deliverables relating to the health information exchange). See Health & Safety Code § 130251.15. The Commission on Judicial Appointments (as to certain recordings). Commission on Judicial Appointments, Guideline 7. The California Education Information System. See Education Code §§ 10601, 10603. The State Fire Marshal (as to promotional examinations). See Health & Safety Code § 13159.8. County of Santa Clara v. CFAC held that the State of California, or any government entity which derives its power from the State, cannot enforce a copyright in any record subject to the Public Records Act in the absence of another state statute giving it the authority to do so. Note: Works that are considered "public records" but were not created by a state or municipal government agency may be copyrighted by their author; the Supremacy Clause of the United States Constitution prevents state law from overriding the author's right to copyright protection that is granted by federal law. For example, a state agency may post images online of the final appearance of a building under construction; while the images may have to be released by such agency since they are public records, their creator (eg. architecture/construction firm) retains copyright rights to the image unless the contract with the agency says otherwise. See: Government-in-the-Sunshine Manual: To what extent does federal law preempt state law regarding public inspection of records?. Disclaimer: The information provided, especially the list of agencies permitted to claim copyright, may not be complete. Wikimedia Commons makes no guarantee of the adequacy or validity of this information in this template (see disclaimer). Bu dosyanın temsil ettiği şeyin tek satırlık açıklamasını ekleyin. güncel 19.22, 24 Nisan 2018 900 × 600 (154 KB) Gutten på Hemsen General cleanup. Removed watermark. 23.32, 26 Ekim 2012 900 × 600 (365 KB) DevinCook Updated plot. I had left out some grass between the first and second legs. 07.12, 21 Ekim 2012 900 × 600 (385 KB) DevinCook Changed the lettering again. The new lettering is designed to be both more readable and to look reminiscent of the defacto manufacturer appearance. Also, the letters were proportioned using 1/100 of the hoist as a base. 01.16, 10 Eylül 2012 900 × 600 (386 KB) DevinCook Cleaned up the lettering a bit. The leg shaded was updated to better reflect the official rendering. The grass plot was off just a bit. 20.28, 23 Ağustos 2010 900 × 600 (418 KB) DevinCook Improved shading of chest using black and white rendering found in old copies of the California Blue Book. 20.26, 25 Nisan 2009 900 × 600 (520 KB) DevinCook Modified the star for better ratios. Removed extra points from bear (reduces file size). Modified white claws. 18.34, 24 Aralık 2008 900 × 600 (611 KB) DevinCook Recreated the red star. The spoke ratio was off very slightly in the last version. 08.15, 24 Aralık 2008 900 × 600 (612 KB) DevinCook I manually redrew the flag using the image found in California Law 54-J-03. This includes the outline of the bear, shading of the light-brown as well as the grass plot and tuffs of dirt.